I started with an A2 card base and added a 3 /4 inch strip of Crumb Cake cardstock that was embossed using the Square Lattice Embossing Folder (my go-to folder for masculine cards). Then, I added a Basic Black piece of Ric Rac that was die from the Tasteful Trim die. 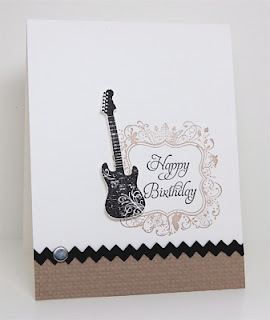 I stamped the frame from Elementary Elegance in Crumb Cake ink and the guitar image in Basic Black on scrap paper, fussy cut it and adhered it with a pop dot. I finished the card off with a simple silver brad. Today I also have for you The Outlawz CAS Challenge: To use an animal OR animal print. Join us, we'd love to see your creation!!! Well, this is one awesome card--any young guy (and maybe some old ones, too) would love to get this! Thanks for playing with the Paper Players this week! This card ROCKS! Great layout, love the ric-rack trim, the colors and that fussy-cut guitar...Thank you for joining us at The Paper Players! I love both of your cards, they are amazing and perfectly CAS. That baby card is super sweet! Thanks for joining us at the Paper Players! Yes your card is pretty simple did you use debossing or embossing on design up on the card?